'Fraid it does, Don. Although they don't cause problems very often, so there's little or no mention of them on this forum, to date. I did hint at a possible problem with one further down this thread. There's also a mention I made of them, a couple of years ago, in this post (and other links) on RLT. To quote myself: Unfortunately, on the 7A38 movement, the equivalent 'centre wheel' is in the middle of the train wheel bridge. Thats what I was afraid of--A "seiko system"----- This mvt runs until it tries to pull date wheel then minute hand stops-also the set position stem turns very easy. Right, at the risk of getting sent to stand in the corner for not reading every possible thread before commenting/asking, ( which I think I have done) here goes. just gave a few sharp taps with my finger and also with the plastic handle of a screw driver to be sure but no movement at all. Time for me to 'fess up, methinks. I have a 7A38 (of sorts) that demonstrates these exact same symptoms and has done so regularly for at least a couple of years. I suspect some members, who don't understand my enthusiasm for them, are already fed up to the back teeth of me extolling the virtues of the Yema Spationaute III. Well not every example in my collection (a dozen of them) is perfect. Far from it, in this case. The 38mm 'reduced' blue-dialed model # N80A66 is one of the rarer variations. I bought mine off the MWR forum in late 2010 from this FS advert: http://www.mwrforum.net/forums/showthread.php?p=124951 In fact, I paid only $75 for it (I split the lot with another collector who wanted the ana-digi Spationaute - for resale, as it turned out). The watch was a complete mess. It had clearly been buggered about with before. As received, it didn't have one endearing feature. My biggest initial concern was sourcing the correct original screw-down crown for it. I documented my logistical trials and tribulations (and eventual success) in a long-running thread on RLT, started in November 2010. I subsequently had the hands re-lumed, although the colour of the 'aged' lume infill wasn't exactly what I'd hoped for. It was some time after I'd reassembled it (and put it away in my Yema collection box) that I noticed it was losing time. So, I sat up with it a couple of times, watching the day / date change over (which always worked fine) in the middle of the night. It usually lost about half an hour during this period, though even with another watch sat beside it it wasn't easy to see it slowing down. (The constant seconds hand continues to 'tick' at the same rate as a normal working watch, it is the only the minute hand that slows). Reason I haven't bothered doing anything with it since is simply that it's a low priority for me, because of the overall general condition. Were I that bothered about it, I'd simply swap out the movement, because I'm pretty certain the root cause is a slipping cannon pinion. PS - prompted by this thread I've just got the watch out, moved the hands around to 11:00pm (and thereabouts) and tapped the case. There is no sign of the minute hand flopping around loose, but there is obviously slippage occuring during the day / date changeover. So it's clearly very marginal. PS How do I link up to this thread to get email notifications when there are new posts added to it. I don't think you can, Phil. Webs forum software is pretty basic (minor understatement). Just means you'll have to look in on us more a little more frequently (rather than leaving a year between visits), I guess. So you've got a second 7A38 demonstrating this same problem, Don ? That is unlucky ! The added day / date complication is definitely turning out to be the 'Achilles Heel' of the movement, in more ways that one. Perhaps that's why Seiko 'beefed up' the later calibers' PCB to cater for the extra current drawn during date changeover. (7A28's use p/n 4001.725 versus 4001.726 for all other 7Axx's). I guess I've been very lucky in having just that Yema demonstrating the slipping cannon pinion fault (in over 200 7A38's in 5 years). But then it had obviously been considerably buggered around with previously, by some less than artful watch-botcher. I have had another NOS 7A38 which did have serious timekeeping issues though. It was a stainless 7A38-7260 I bought from an Italian seller back in June 2011. That one's hands didn't slip as such. It simply slowed right down - sometimes stopping completely overnight. 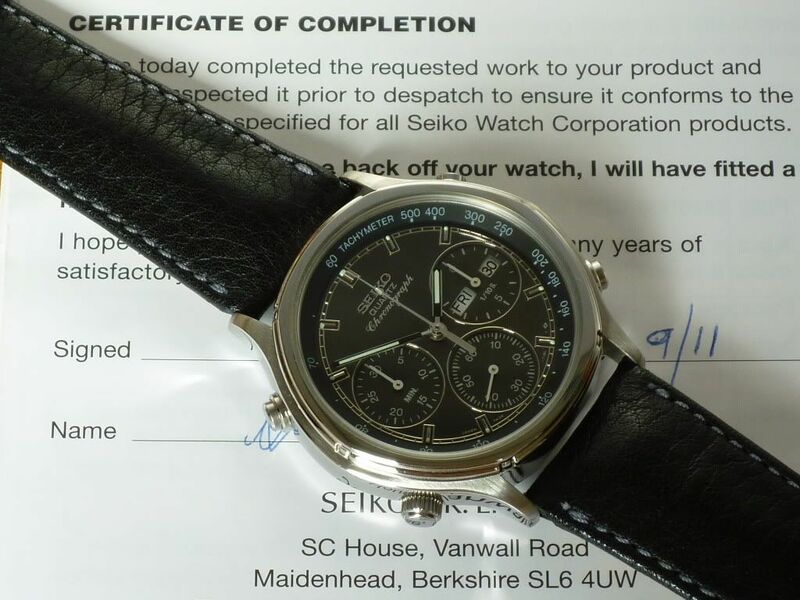 Luckily, the seller (an authorised dealer) included a Seiko 12 month warranty with it, so Seiko UK serviced it for me free of charge. Update, another night has passed and I think we have fixed it, that finger tapping seems to have loosened her up and it was spot on time this morning. However, this does mean there is a bit of dirt floating around in there so I need to get in there and blow it out, maybe remove the day and date disks for a gentle clean. It seems the date wheel is ok but I guess it will need to complete a month of trouble free time keeping to be sure of that. Well Don, despite yours and Phil's 'lucky fixes' I can assure you that the 'slipping cannon pinion' problem exists. You remember I wrote that my 38mm blue dialed Spationaute III had previously been exhibiting the symptoms - losing approximately half an hour per night. Since I got it out again it's got much worse. The last two nights, the hour and minute hands stopped moving at 00:50am - around the time the movement starts to engage the day wheel, after having successfully flicked over the date. Yet the (time) constant seconds hand is still merrily ticking away in the morning. When you pull out the crown to wind the hands on (8 hours or so) to the correct time, everything feels normal. Indeed, the watch appears to keep good time to around midnight. I think a movement swap is well overdue. Interesting Don, I have now discovered that mine resorts back to losing about half an hour on the day date change if I have the chrono engaged, with the chrono off she is fine every time and doesn't loose a beat on the change over.